This year’s NCAA Final Four has been surprising to say the least.. epitomizing the phrase from ABC’s Wide World of Sports years ago (I date myself!) — “the thrill of victory and the agony of defeat.” Both reasons for a cocktail — to either celebrate or swallow the loss. Here are themed cocktail ideas for each team in the 2018 championship event. Villanova: The Villanova is intriguing with some harder to find ingredients. USC plays Western Michigan on Sept 2, 2017, at the LA Coliseum. Potato chips, a green salad with apples, plus cherry cobbler squares for dessert round out the Michigan components for a pre-game lunch. We will also imbibe the Vernor’s ginger ale with and without spirits. Vernor’s is one of the nation’s oldest soda brands (read more), and easily available in Smart and Final stores in our area. Last weekend’s Utah vs USC tailgate embodied the Utah theme, including several Jello items (a cranberry juice and jello combo overflowing with multiple types of berries, red and yellow jello shots, and a US flag (to honor 9/11) jello dish), as well as a take on Mormon funeral potaotes (potatoes with lots of cheese and crunch on top). Along with the bbq tri-tip, chicken, green salad, 3 bean salad, assorted fruits and cheese, etc., the pre-game meal was a hit. Post-game we enjoyed corn chowder (Native American reference to the Utes), spinach salad, popcorn, french bread, and several desserts (oatmeal bars were spectacular)! This week, we play Syracuse! Jello is an unofficial state food of Utah. Mormons (many of whom live in Utah) do not drink alcohol per their religious beliefs. What better way to combine Utah with the Utah/Mormon-opposite than Jello shots? So this weekend, I made these for the tailgate… however, I toned down the alcohol after I read how people tend to not be cognizant of the amount of alcohol they are consuming with jello shots and get themselves in trouble. 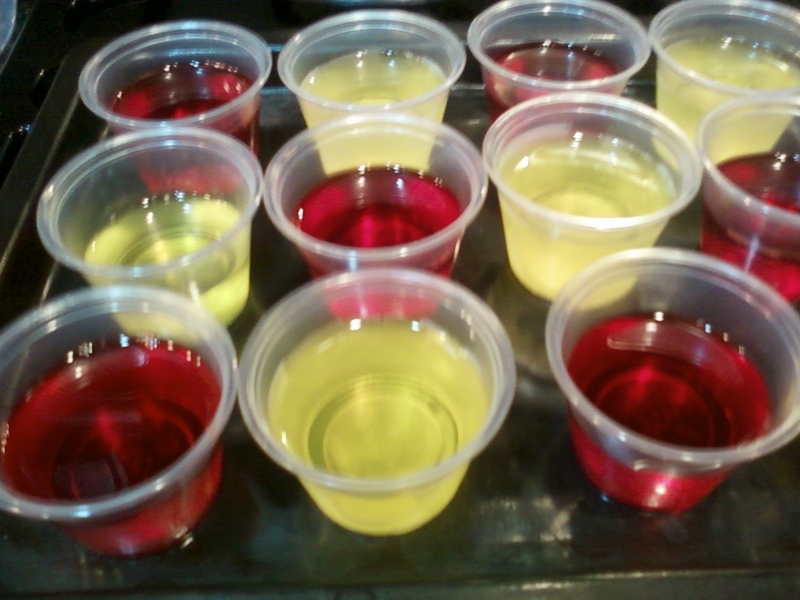 I decided to make Lemon/Citrus Vodka and Cherry/Rum jello shots (red and gold! )… Basically you need two cups of liquid…so I decreased the alcohol to 3/4 cup plus 1/4 cup cold water…. for the 1 cup cold liquid. See my photo below. Another item on this vein is mixing jello with coffee (no caffeine for Mormons either)…. 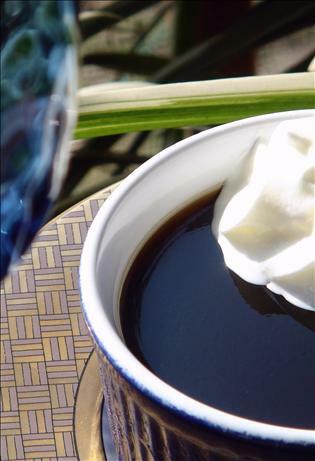 click here for a coffee jello dessert that my friend Steve found on the internet (photo is from this site too)– a dessert to be served with whipped cream — including Kahlua is optional. I wish I had time to make this as well! 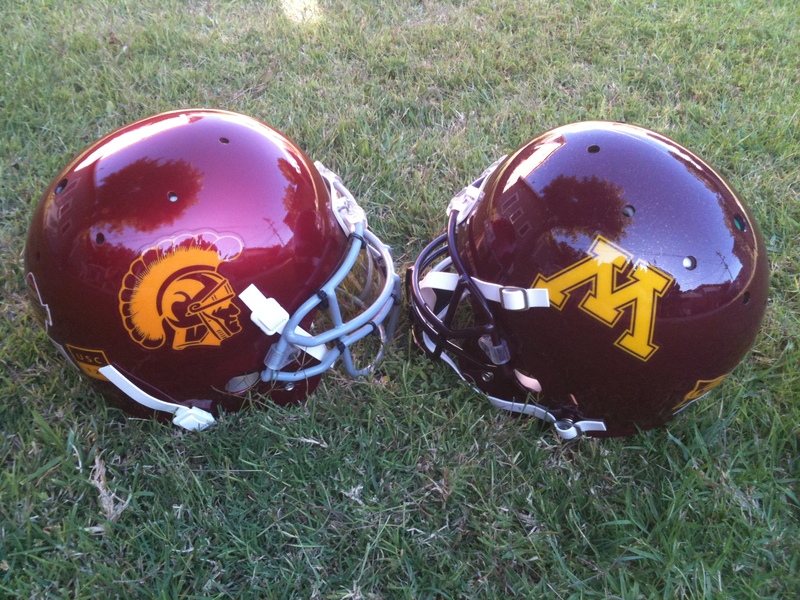 The USC vs Minnesota football tailgate meals on Sept. 3 are now a memory. The Los Angeles Times Sports Section headline for the game was “Score Bored.” I thought that appropo. The new scoreboard is brilliant and engaging, even distracting, as I often am compelled to watch it rather than the action on the field. However, the long, rectangular swath of image is a middle-section truncated version of the more square version shown on the opposite, old vision board — thus often, I felt like I was missing something — as if looking through an opening in a fence. So I like the new board and I then I don’t. As for the game… as everyone keeps saying “a win is a win.” The second half was long, boring, and play-uneventful –that is all I will say on the game, with USC squeaking by Minnesota 19-17. For breakfast, we enjoyed a luscious fruit medley, yogurt parfaits, bagels and cream cheese, SPAM (as it is made in Austin, Minnesota), and several egg dishes. 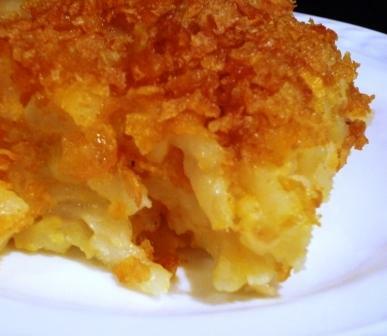 The Minnesota Breakfast hot dish incorporated eggs, cheese, sausage and cream of mushroom soup — click here for recipe. Post-game, we enjoyed chili, hot dogs, brats, corn salad (for recipe see prior post), green salad, brownies, cookies, and a coconut cake (reminiscent of Minnesota’s frozen landscape). We enjoyed tailgating with a contingent from Minnesota (including a current student)… great fans..fun to interact with and learn about the University of Minnesota. 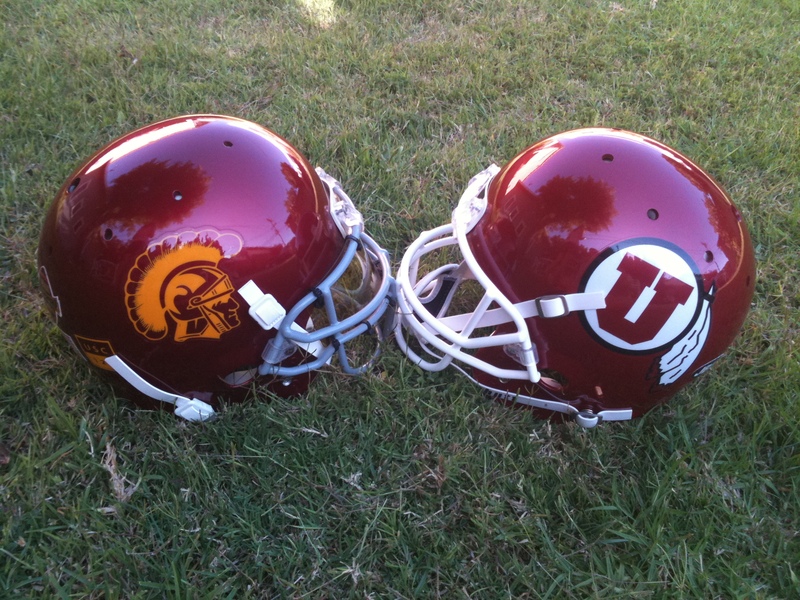 Next game is coming up next weekend, Sept. 10th against Utah. Watch for posts re: Utah foods! So far I see that Jello is the Utah food… more later.